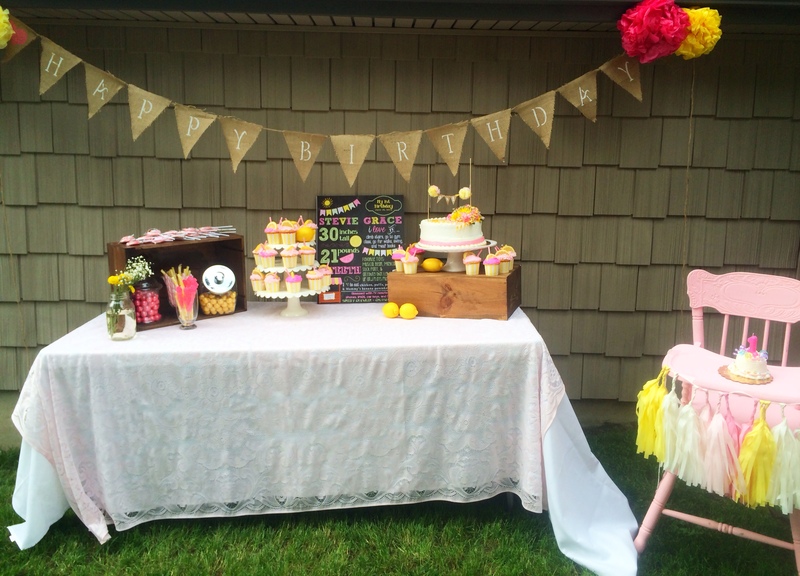 Yesterday, I had the pleasure of working on the second and last pink lemonade stand themed birthday party by pumpkin + rose of the season. So perfect of a theme for the summer that it had to be done twice! 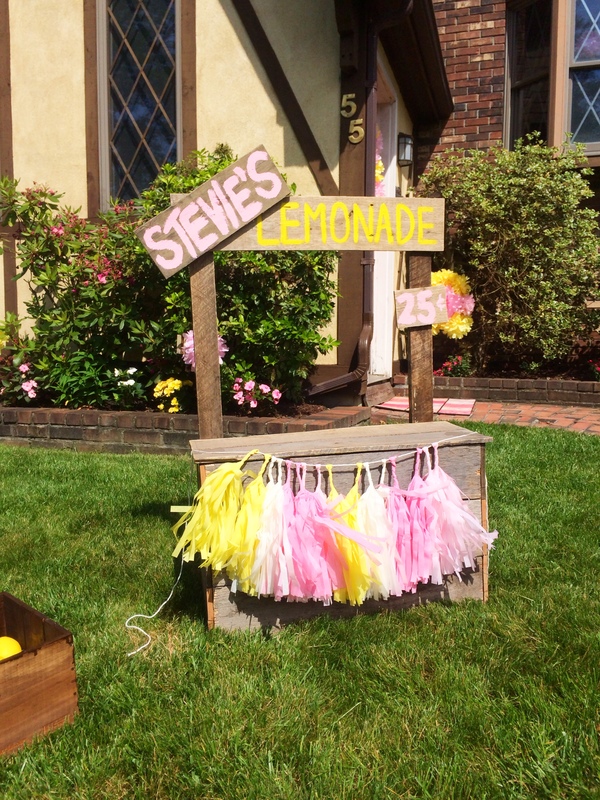 The small lemonade stand greeted guests as they arrived. 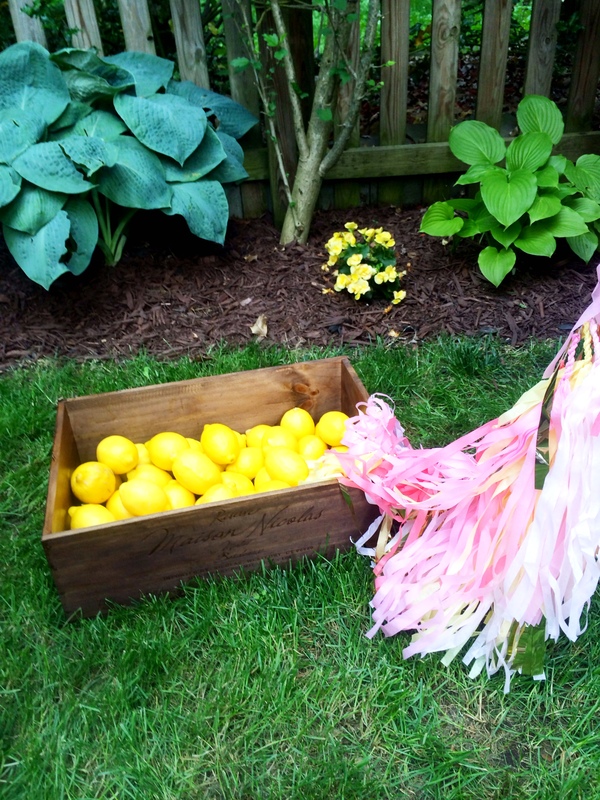 Pink, yellow and white tissue paper tassel garland can be seen throughout the party. And more tassels on the strings of the over-sized pink balloons were pretty and festive. 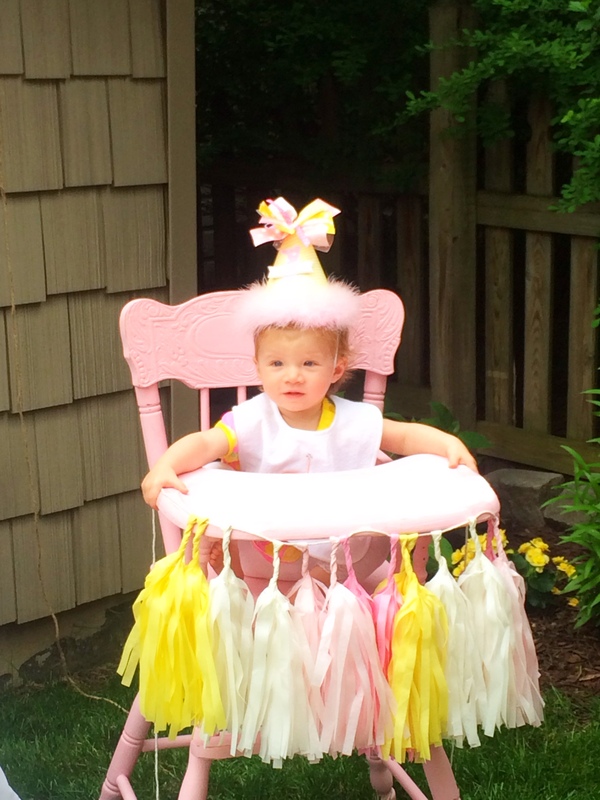 The birthday girl’s mom made this adorable tissue paper letter “S” for the front door. 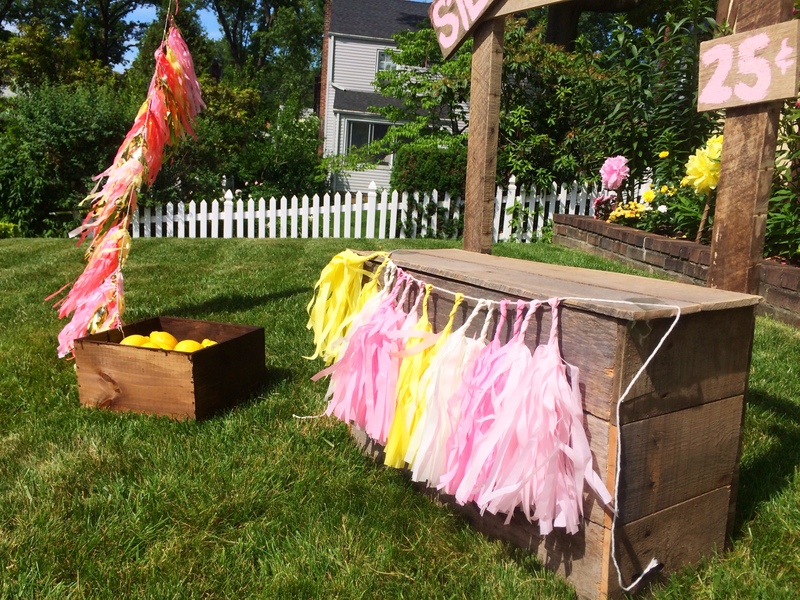 Tons of real lemons filled crates and decorated lemonade stands and tables. The bright color made the whole space cheerful. 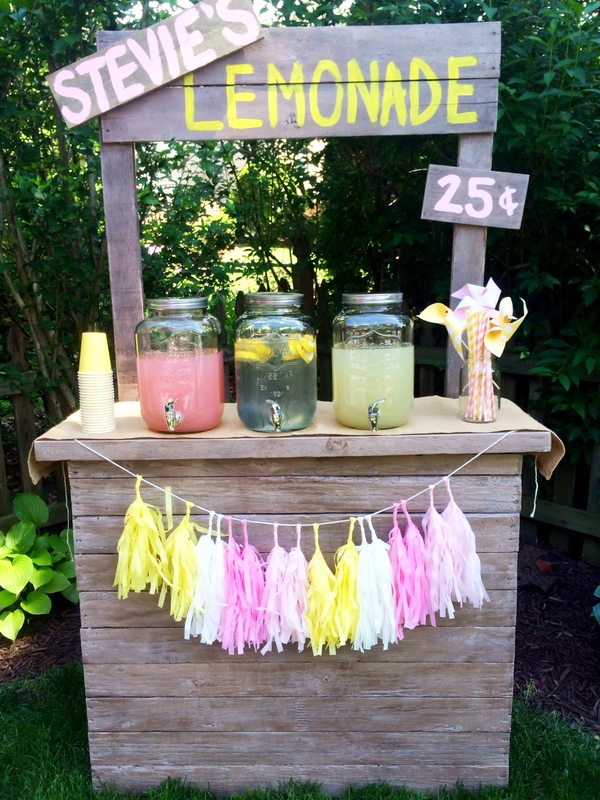 Everyone helped themselves to pink and yellow lemonade and water with lemon slices served in old fashioned mason jar drink dispensers. 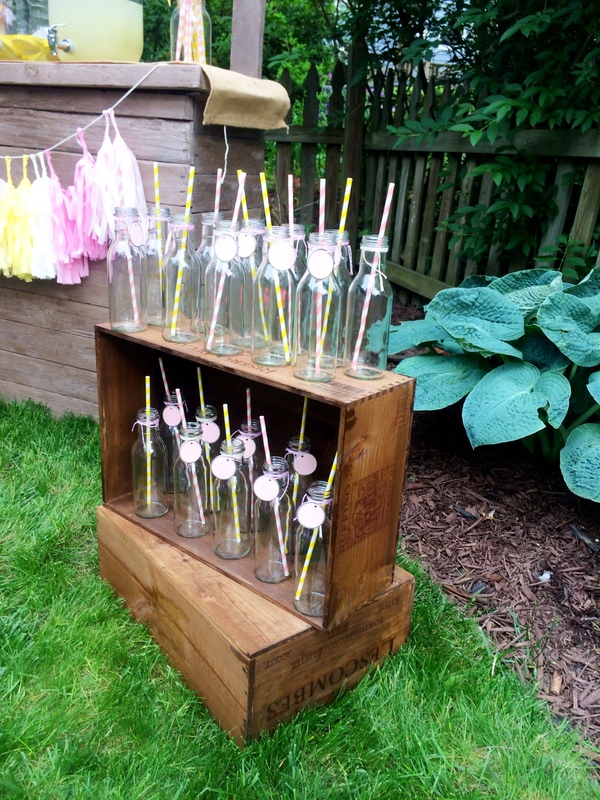 Glass milk bottles doubled as decor and then a place to put the sweet lemonade. 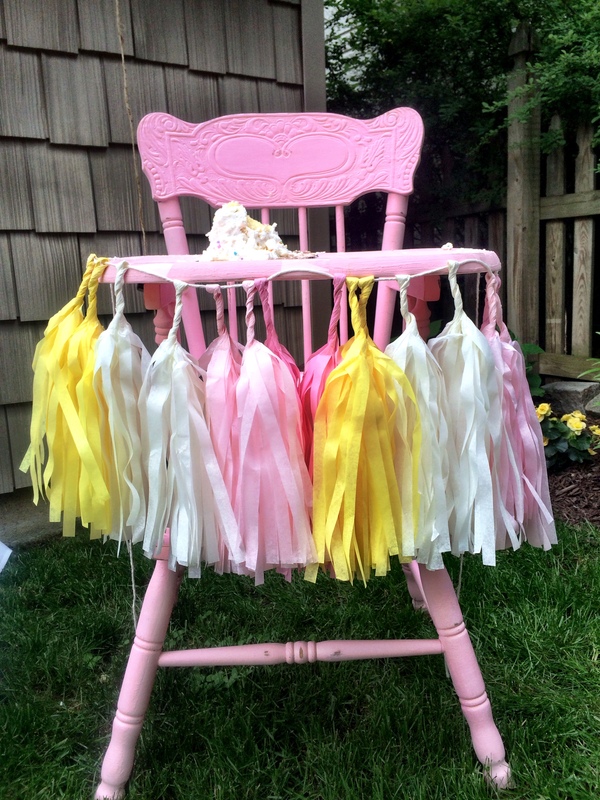 Tied with pink and yellow twine and adorned with pink tags, they kept in line with the theme. 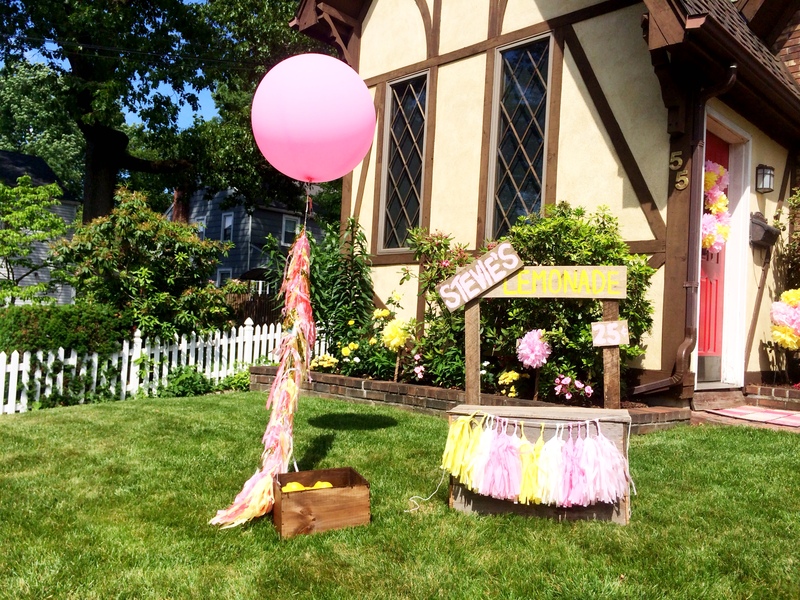 Another huge balloon with a pretty tassel added a fun, whimsical touch to the backyard. 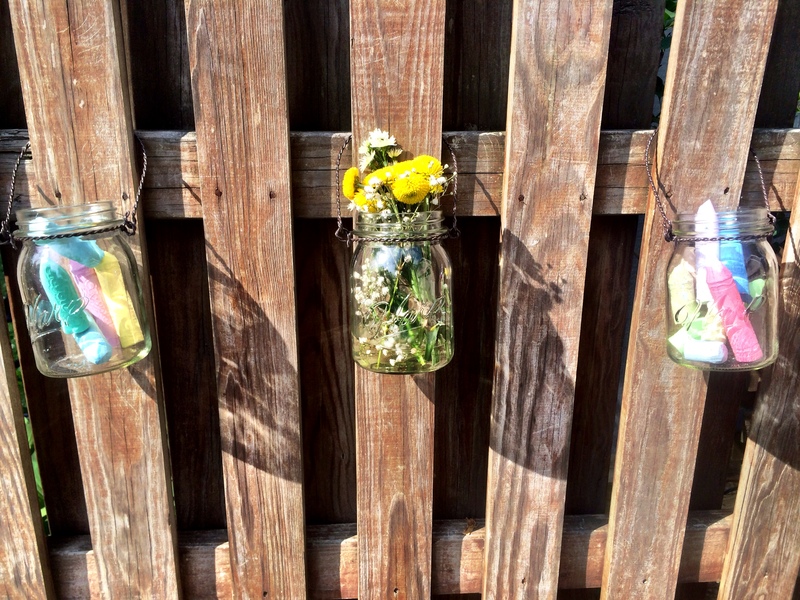 I hung mason jars filled with colored chalk (and flowers) on the fence alongside the driveway to keep the kids busy and entertained. 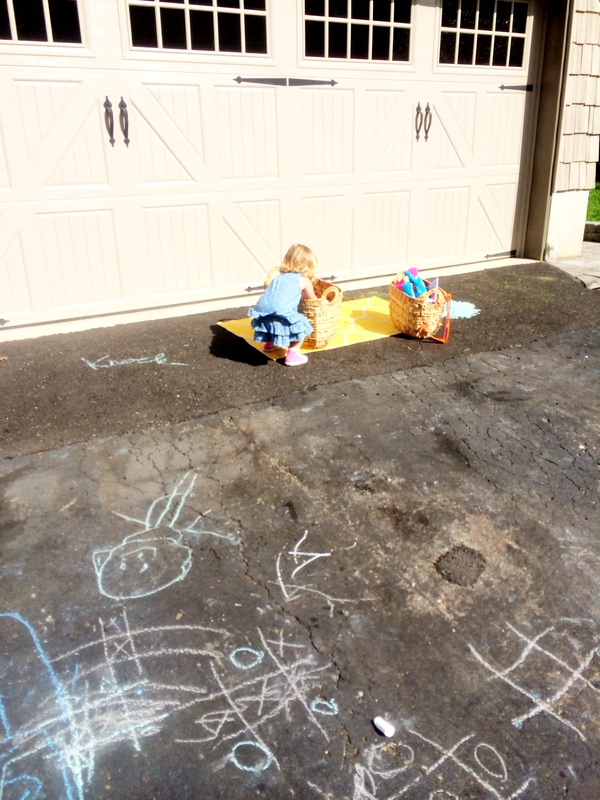 The driveway and the wooden panes of the fence were decorated with the kids’ artwork at the end of the night. 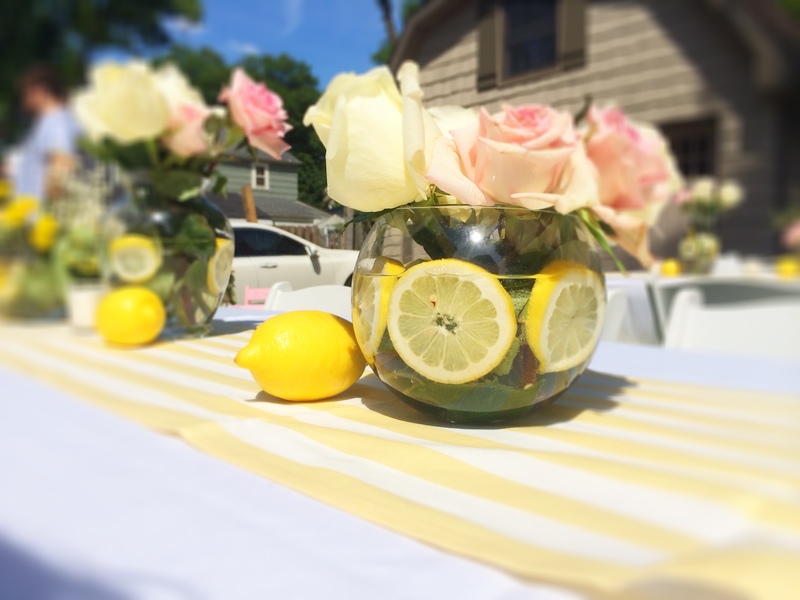 Pink and white roses were placed in vases of different shapes and sizes and lemon slices were added to all for a pop of yellow. 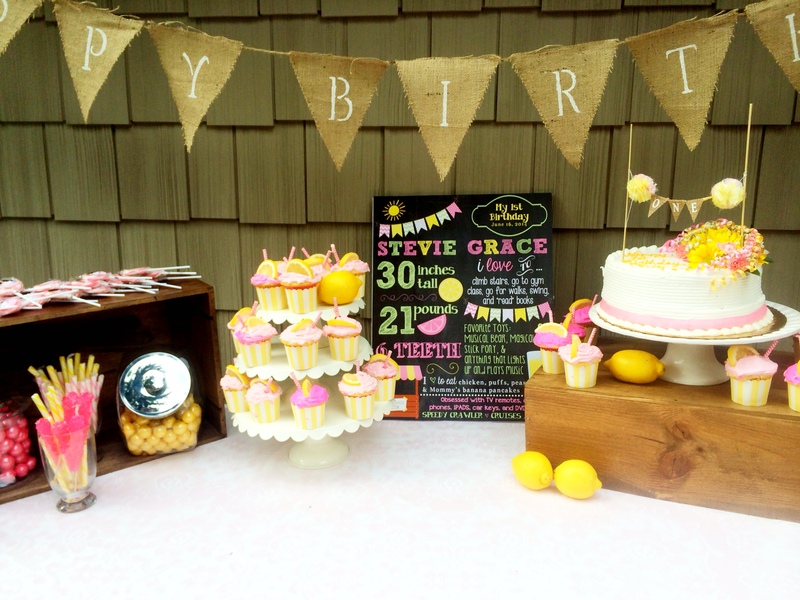 The yellow and white striped table cloths were a perfect match. 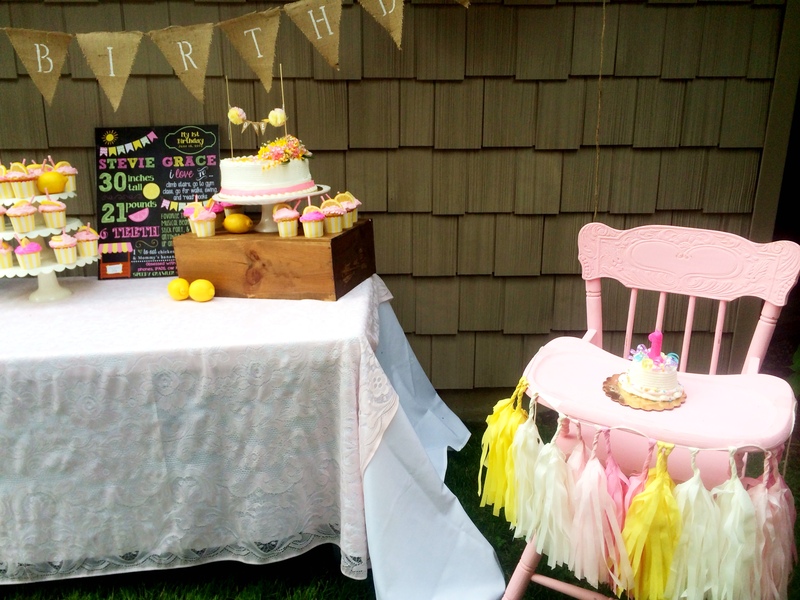 I painted and distressed an old wooden kids table and chair set for the little ones to have a place to hang. Onto dessert! 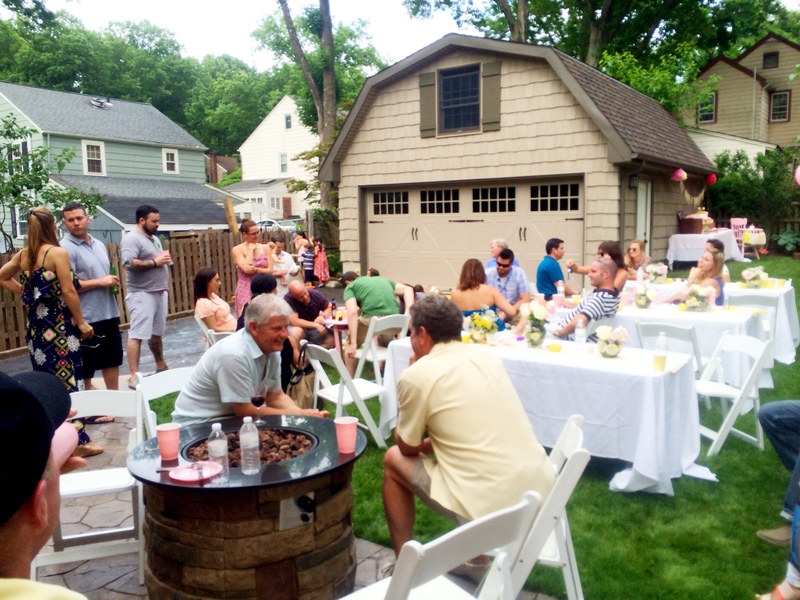 Always my favorite part of the party. 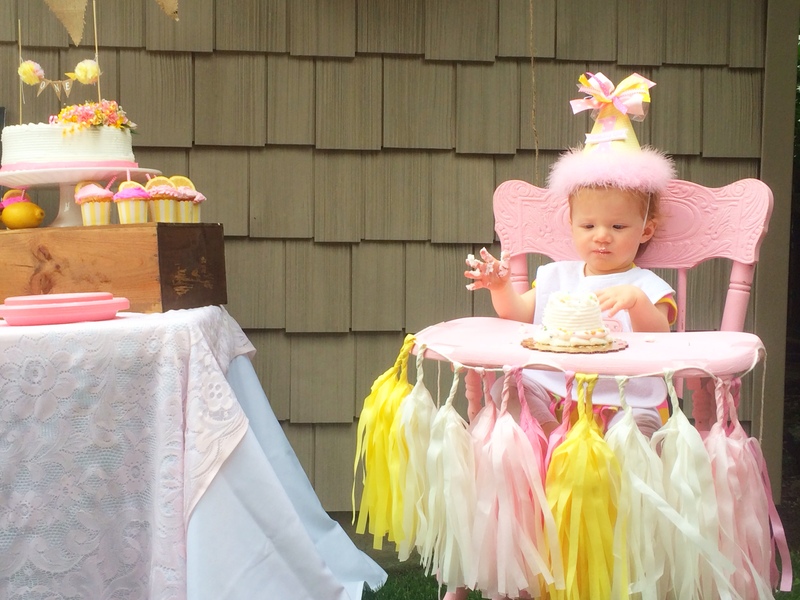 There was pink and yellow candy, pink lemonade cupcakes and a white and pink cake topped with real flowers. 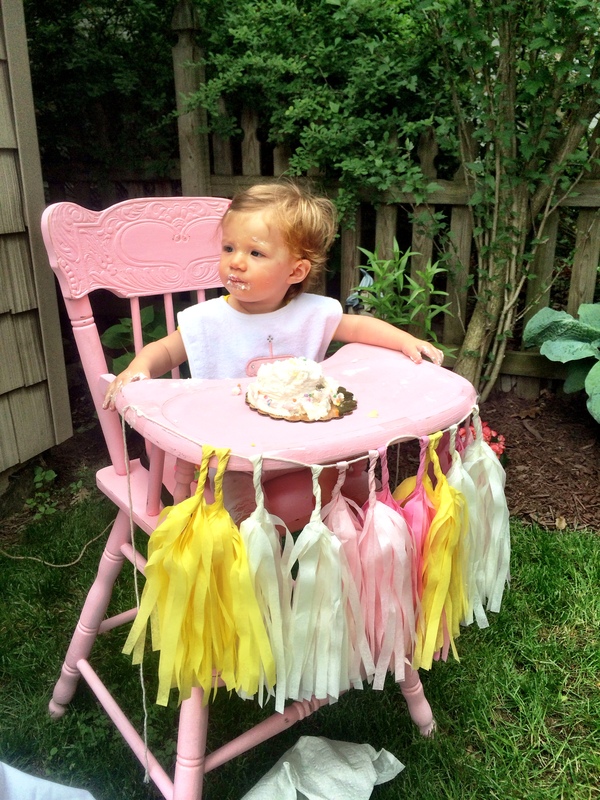 The cake bunting was a mini-version of the tissue paper pom poms and burlap banner seen above the table. 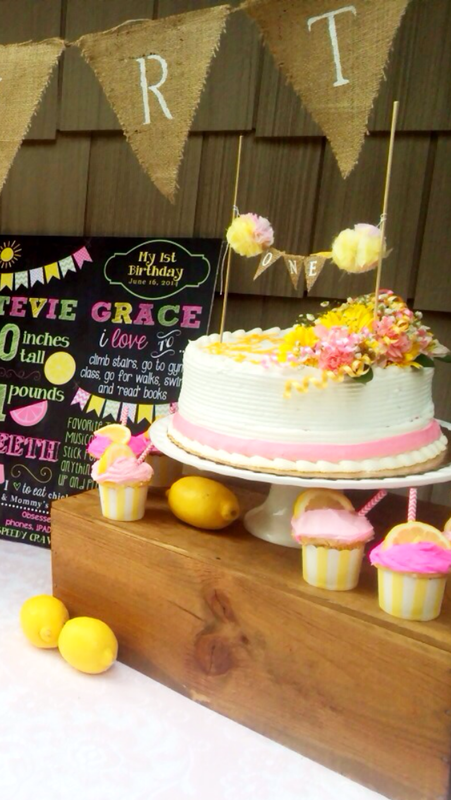 I loved the chalkboard print that highlighted all of the birthday girl’s favorite things. 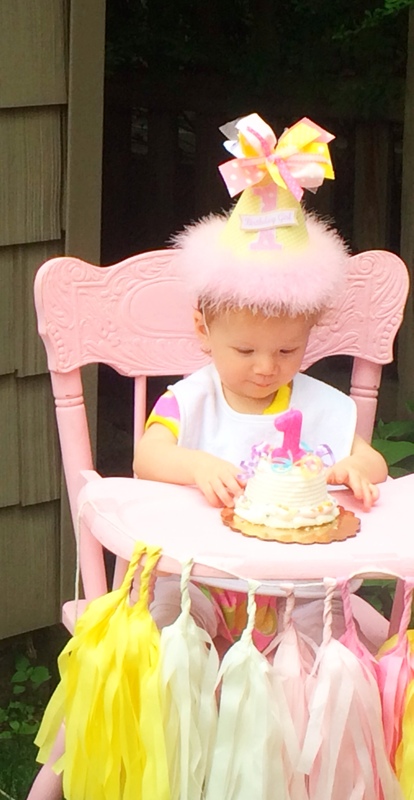 Someone eagerly anticipating her tiny cake. 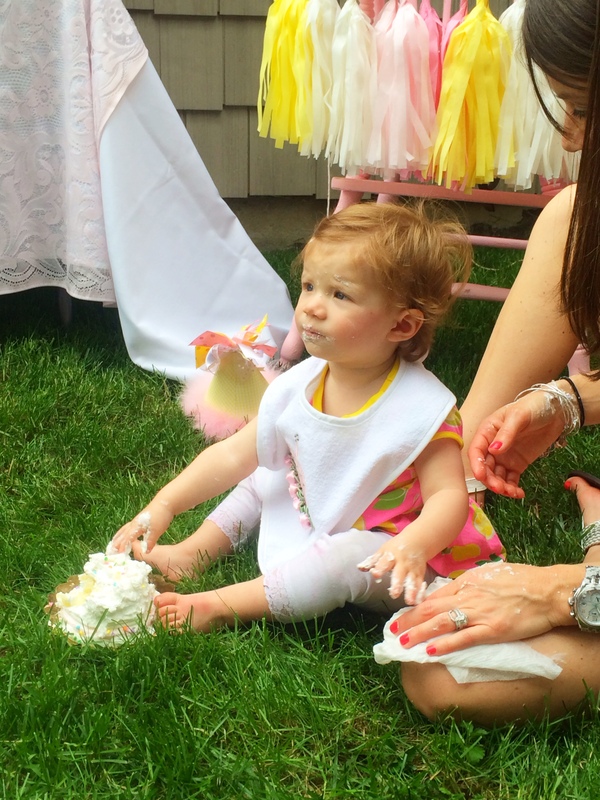 The new one-year-old getting ready to dig in. 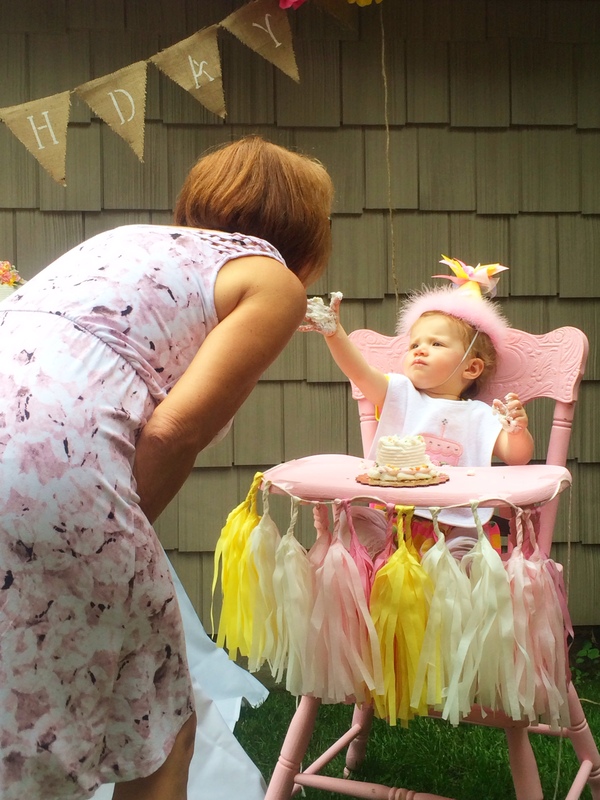 She moved the party onto the lawn, but the cake came with her. These pics are great and the day was perfect! 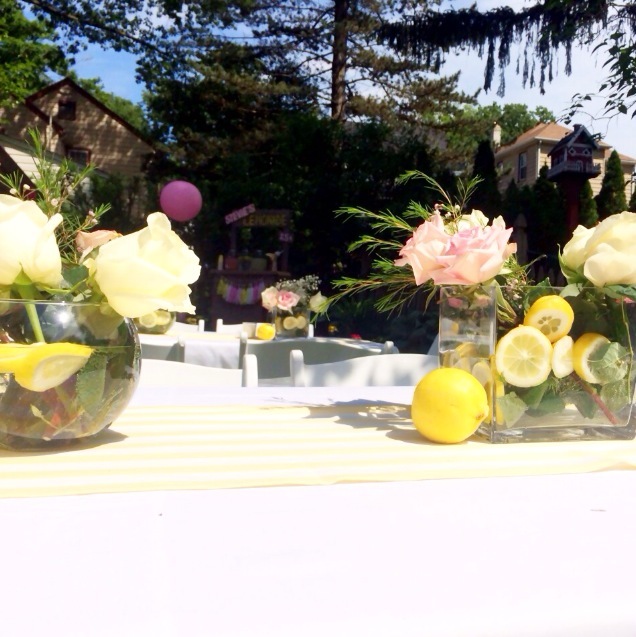 Gina you are an amazing friend and party planner!!! 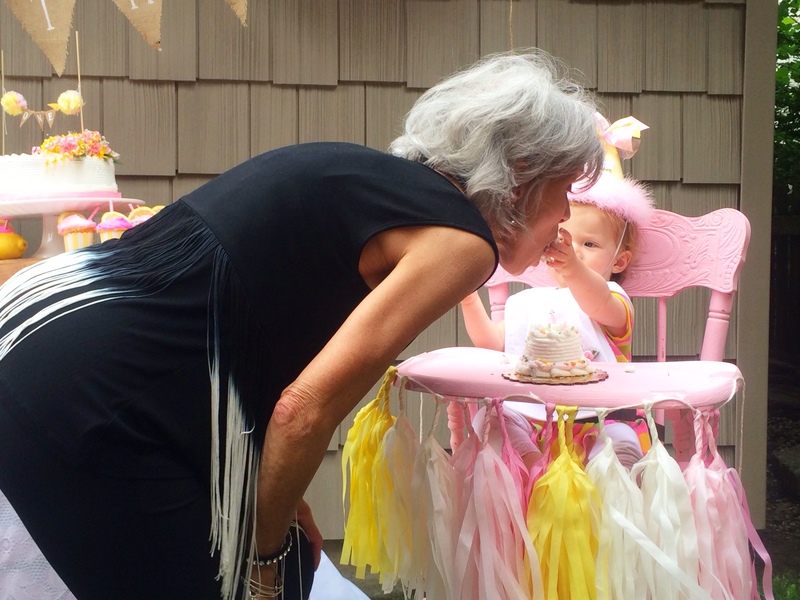 Thank you so much for all of your hard work and making Stevie’s day beyond adorable, memorable, and fun! 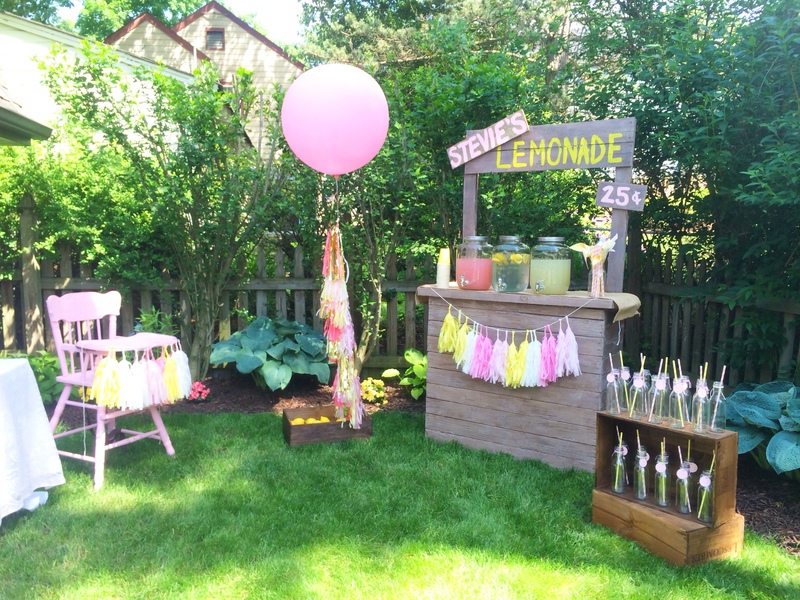 Such a great theme for a summer party! So coordinated!! 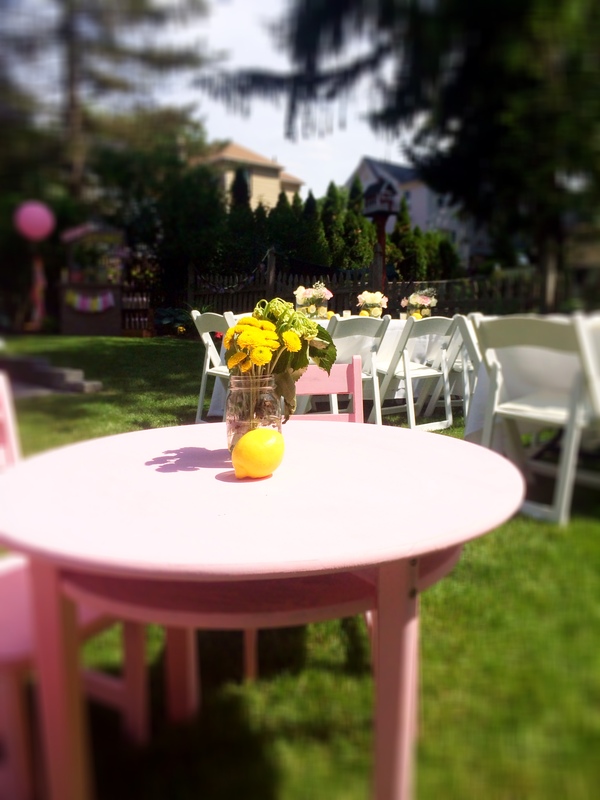 Loved the pink table and colored sidewalk chalk for the little ones! You thought of everything! I was impressed. Everything was so professional. The theme was awesome. Good job Pumpkin + Rose. thanks so much, tombo! really appreciate the support!! I always spent my 30 minutes to read through this weblog’s posts everyday together with a mug of coffee. you made blogging glance easy. The total glance of your website is great, let alone the content material!